Impressive vegan dishes with added zing and live music create a winning formula for this St George's Cross neighbourhood hangout. 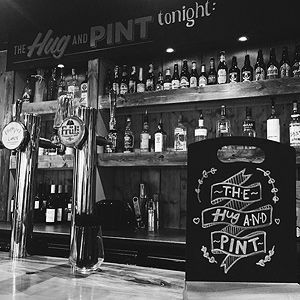 Most people who encounter the tender embrace of the Hug and Pint become an evangelist for its singular charms. An icon of Woodlands’ burgeoning play to be the epicentre of West End food trends, here you’ll find genuinely impressive vegan dishes, often served to the soundtrack of local musicians who play and eat here. Before you look at the craft beer menu and shout 'cliche', they are firmly hip, not hipster here. It's a surprisingly successful formula – it turns out the vegan venue Glasgow never knew it wanted was exactly the kind of place it needed. Take a seat on the wooden benches and start loading up on healthy combinations such as spiced coconut soup and pickled papaya salad or taste the unusual with mushroom rice pudding, crispy shallots and pickled onion. Their kitchen serves five or so dishes a day -– and yes, they are named after the Arab Strap song. The singer-songwriter and musician from Melbourne plays folk, pop and soul. The New York banjo player and his band play their own take on alt country and Americana in their original material. Australian musician Emerson Snowe makes dreamy nostalgic indie. He's already supported the likes of King Krule, Ariel Pink and Courtney Barnett. Welcome to his twinkling, twisted time warp. Presented by Eat Your Own Ears. This is an 18+ event. Native Welsh and Cornish speaker Gwenno is a musician, singer-songwriter and DJ. Presented by Houses in Motion. This is a 16+ event. Folksy blues from the Canadian singer-songwriter. With Paddy Hanna and Junior Brother. Hare & Hounds presents Murkage Dave at the venue on October 8th. Lo-fi post punk from Seattle. This Is Tmrw welcome Sam Evian to Hare & Hounds on Monday 21st May 2018. London-based singer-songwriter who has collaborated with Keane, Stephen Fretwell and The Staves. The South West of England-based group performs its indie-Americana compositions.